Lee Baermann's love of fishing began at an early age when his maternal grandfather showed him how to catch Musky in the lakes of Northern Wisconsin. Milwaukee to Oxnard, California in the early 60’s, that love continued, not only at the local lakes in Ventura and Santa Barbara counties but on the beach, where he grew up. Lee Baermann has been fly fishing the surf for over 40 years. Lee guides us on California's southern coast finding beach structure, surf species, productive flies and fishing techniques. Join us and find out how get the best out of the surf. As a child, Lee began fishing from the docks with a 50 cent drop line, graduating from there to spinning gear, then to a long surf rod, and finally to a fly rod. Lee fishes the So. 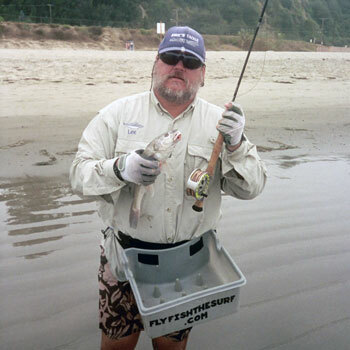 California surf at least 300 days per year; Whether guiding for his business, ‘FLY FISH THE SURF’ or just for fun, Lee has caught Barred Surf Perch, Corbina, Halibut, Leopard Shark, Striped Bass and all of the other surf species. When Lee is not fishing in salt water, you can find him in the local canals guiding for Carp. On most Fridays, Lee can be found at Eric’s tackle in Ventura, California tying flies and spreading the word on the ease of fly fishing from the beach. Most conventional fisherman express surprise at the fact that there is a sport like fly fishing in the surf. Lee is also on the pro staff with Rajeff Sports and Waterworks-Lamson Fly Reels, Solarez UV Epoxy, Sockwa water shoes and Dr Slick fly tying equipment. Lee is a full time surf fly fishing guide, living in Oxnard, California with his wife, Karen and their Akita dog, Nana.